We had a great week at Cameron Middle School! We wanted to build on our work from last week's coding lesson, so we decided to step it up just slightly. In this week's activity, students are meant to write directions for a person trying to navigate a city, while searching for a hot dog store. City blocks give the opportunity to program simple directions for navigation, but different perspectives on the directions being given to our imaginary character make it difficult to tell which way is best! As students work their way around the city, they have many opportunities to mess up and refine their "code." After they have reached the end, they can try to come up with some unifying system that would make future directions easier, such as always facing North. We hope that these skills of trial and error and simplifying directions will make future activities easier! Next week is Vanderbilt's spring break, so we won't be at the school. We hope to continue our momentum and work with computers soon, as well as hand out some books! We were flying high at Wright Middle School this afternoon! We continued to work with Shaun Tan's The Arrival, and due to popular demand, we decided to dedicate the majority of the class period to honing our origami skills! It is safe to say that after today, Wright Middle has some expert origami artists. 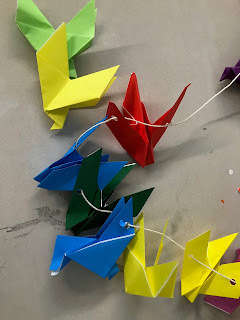 Speed, precision, deft movements, and digital dexterity were all on display, and by the end of our time together we had so many origami cranes one would have thought they were roosting in the classroom. Next week we will finish up working with The Arrival by reading the final two chapters, and then it is on to our next author, Kwame Alexander! This week at Wright Middle School we continued working with Shaun Tan’s The Arrival and the students had a wonderful time! For this lesson, we focused on perspectives, and how individuals experience life in different, unique ways. For our activity, students were asked to step into the shoes of the father in The Arrival, and their task was to describe the immigrant experience from the perspective of the father by designing and writing a letter to the daughter in the story. 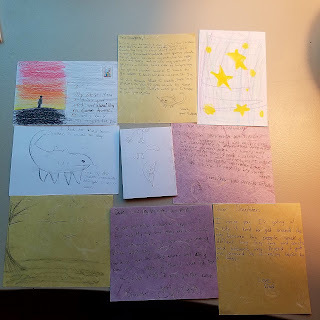 In their letters, lots of students wrote about the many challenges that the father had to come as he attempted to navigate this new, strange city. 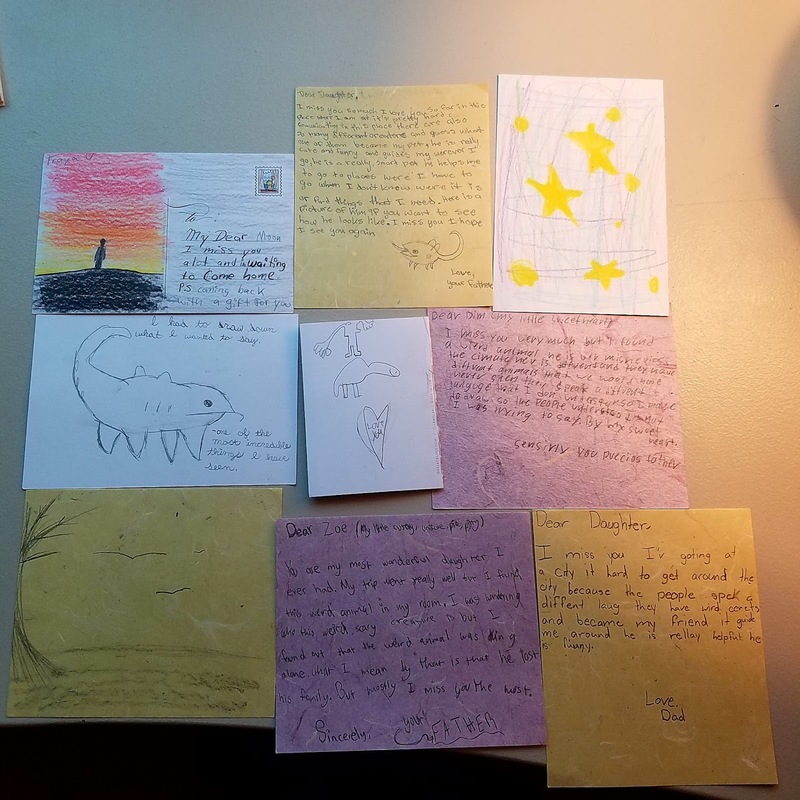 Many students wrote about the benefits of having a creature companion to help navigate the city, and others shed light on the difficulties presented by language barriers and cultural customs. A common sentiment that many students touched on was homesickness, and how the father felt lonely and missed his daughter dearly. Throughout the activity, students were asked to draw connections between their own experiences and the experiences of the father and the daughter in the story. Next week, we will continue to work with Shaun Tan’s The Arrival as we continue our origami activities that the students thoroughly enjoyed. Our week at Cameron was quite different than usual, but it was certainly a fun and informative experience! 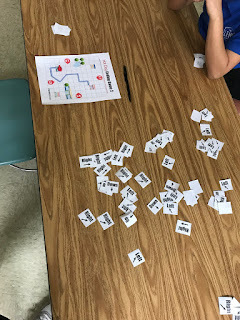 As the students began a unit on inventors, with a particular focus on Steve Jobs, we thought that we could have a good time with some activities that mimicked coding! After watching a video that explained some programming basics, we gave students a sheet that had sample commands and designs. These designs and commands were for students to imitate programmers and a "robot" that would follow the "algorithms." Some students would write commands using this formula, which would allow other students to build a cup structure. After sequestering our "robot," the students got to work! After writing down directions on a sheet of paper, the separate student would return, and try to recreate the picture by using the sheet. Though there were some struggles in this new style of activity, our students came to love the concept! We hope to build on this idea of coding in the future, and we think that, along with readings on inventors and computers, we can help the students in writing some basic code. Some of our students built impressive displays, and we can't wait to see what happens when we transfer these skills to other pursuits! Several Litton RAPS students represented the program so well at the community breakfast last week. We are so proud of them and their enthusiasm for reading. It was awesome! On Friday, students settled in with their book club groups to discuss while they worked on a creative project. They worked on creating postcards from their book. The front image represented a theme, symbol, or scene of their book. On the back, students wrote a message describing the scene. 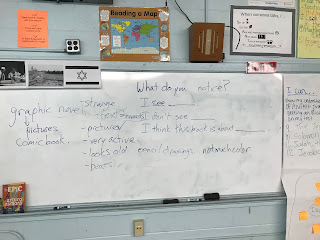 Some students plan to take on the perspective of one of their characters. The students really enjoyed working on these postcards and we will continue with the project next week. Most groups are finishing up their books, so we will begin a new round of book clubs in the next few weeks. Two of the students reading A Long Walk to Water working on their postcards. We love seeing their artistic talent. The group reading Refugee discusses their favorite quotes and characters before beginning their postcards. Some of the Litton RAPS group representing the program at the Litton Community Breakfast! We began this RAPS club time by asking students to share what they noticedThe Arrival by Shaun Tan. As they flipped through the pages for the first time, they noticed that pages looked old, that it is strange that there are no words, and that it looks like a comic book. We collectively thought about how we can read a book that has no words by asking questions and analyzing what the pictures. 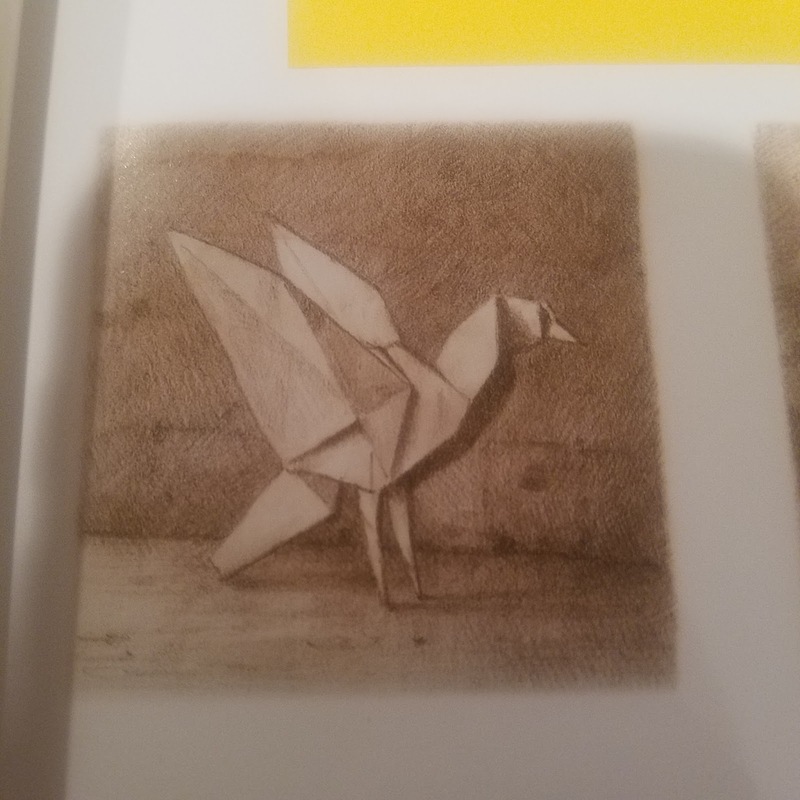 After this brief introduction, we split into three groups, to read and to make the origami birds that appears as a frequent symbol in this graphic novel. Origami was new to many students, and some absolutely loved it, taking home more paper to try their hand at it again. Others got a bit stumped with some folding patterns and were very glad to have finished one! Their birds will soon grace Ms. Barrack's classroom as a decoration and fun reminder of what they made. We look forward to exploring The Arrival again in two weeks! 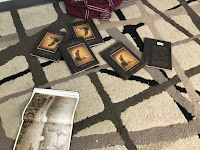 Discussion started heating up today as students began making connections between images and the story in The Arrival by Shaun Tan. Last week, students had found where all the origami was in the book, to see if they notice a pattern with this symbol. Rappers thought that they represented hope, love and a connection to his daughter. 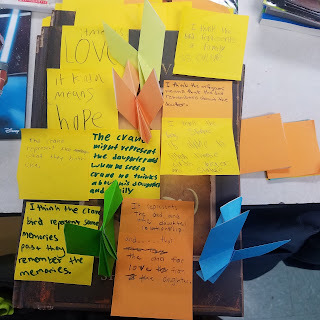 A few students connected origami to letter writing, and spent about thirty minutes working to connect different parts of the story, still working on reading a graphic novel with no text. Next week, we will continue with The Arrival, origami, and letter writing! Our students were so excited to see us for Valentine's Day! They'd spent the day learning some of the norms of the holiday, and our lesson from last week seemed to have stuck! We decided to start with an acrostic poem, using the word "heart." 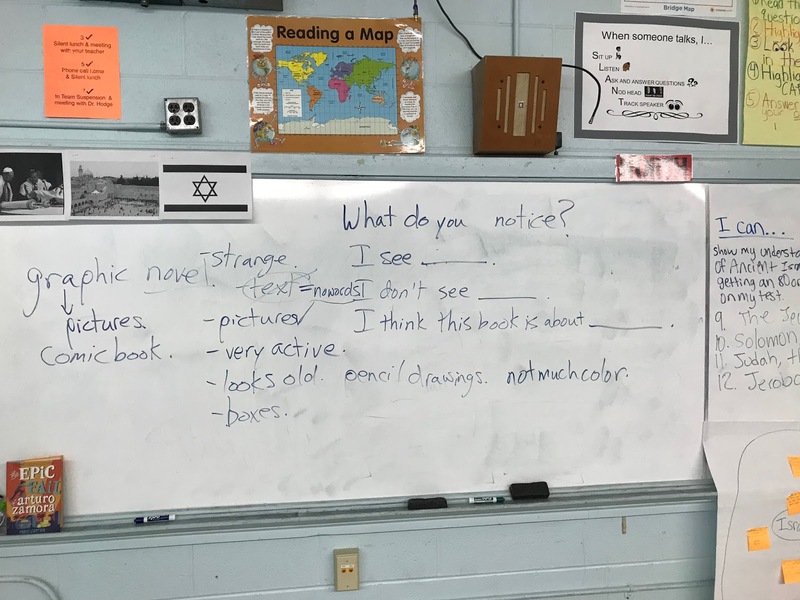 Though the students seemed to have trouble with the concept at first, brainstorming a list of potential words to start each line seemed to really help, and they really liked the opportunity to flex their creative muscles! Next, we asked the students to look at a chocolate assortment, a popular treat on Valentine's Day. We explained that there are a variety of chocolates that come in these boxes, and that some are sweet while others are bitter, some are lighter and some are darker. We asked students to think of the type of chocolate that they might be, based on some of the characteristics that they saw in themselves. We may need some time to finish these up next week, but we can tell that they're off to a great start! Some of our older students wanted to stick to scary stories, so we read a medley of quick stories from Creepypasta.com, an online blog that encourages original submissions of the macabre. The students loved the originality and approachability of the stories, and they may spend some free time reading more! We also spent time brainstorming for future scary stories that they may write themselves! In the future, the classes will be working on a unit on famous inventors, focusing on Steve Jobs. So, we may try to find some sample coding activities and computer-based activities to work with alongside these inspirational figures. We can't wait to head back! Our readers continued to have ambitious conversations this week at Litton RAPS! Students had some silent reading time before meeting with their book club groups...it is always a peaceful start to our Fridays. Once students had some time to discuss their books (which they are all enjoying) we opened up to a group discussion. The conversations took us past the plots of the books and into deeper engagement. What do authors do to make us want to keep reading this book? What keeps us so engaged? 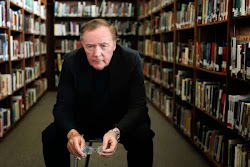 How do we connect to the books? For the students reading Crossover by Kwame Alexander, it is the author's craft and form of the book that keeps them engaged with the book. They love that it is written in verse. One of our readers is on his third reading of Crossover. When we talked about what makes the book so good that he wants to read it over and over again, he said that the character is relatable to him. We know that this is one of the most important factors of loving a book and connecting to it. The other book club groups reading The Hunger Games and Refugee agree that the mystery and intensity of the books keep them reading. Both books end chapters with cliffhangers and big anticipation. We will continue with these books for a few more weeks. Litton RAPS has the very special opportunity to share a little about the program at Litton's upcoming community breakfast. Some of our students will represent our RAPS group, talk about some of the projects we work on, engage in a discussion about our book clubs, and continue to build their school's love of reading! Look out for a special blog post after the event next week. We had a wonderful afternoon at Wright Middle School on Tuesday. Picking up from last week, we continued working with Shaun Tan’s The Arrival. This week, we focused on symbolism in the text, and we approached this topic in two ways. 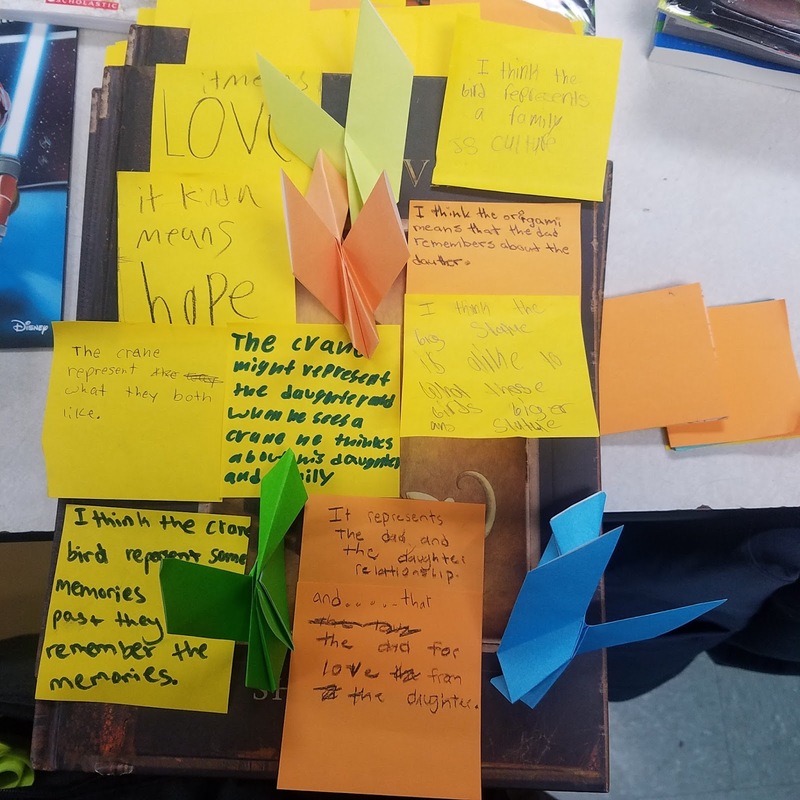 As seen in the picture below, the origami crane is a symbol that appears throughout the book, and we asked half of the class to read through The Arrival, and mark with a post-it not each time the image of the crane appeared. 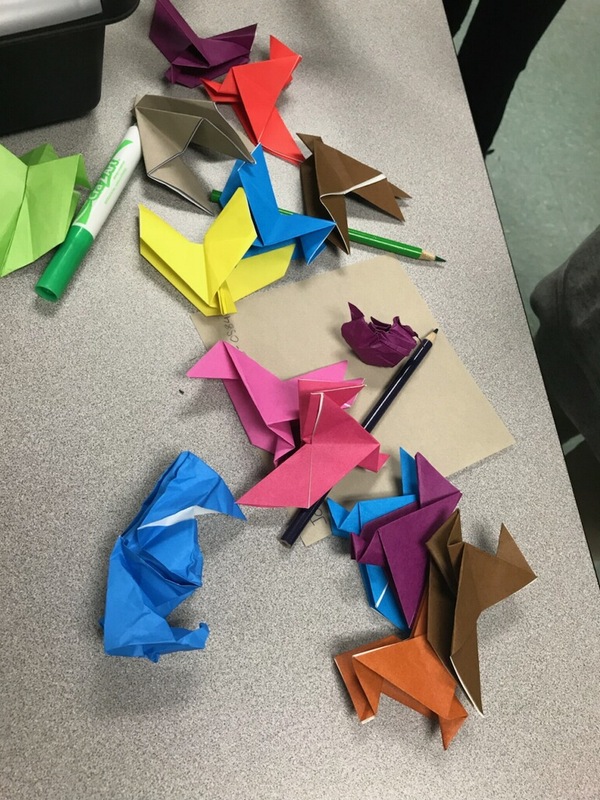 Once this task was completed, the students discussed the symbolism of the origami crane, and cited textual evidence to support their claims for what the crane might represent. As shown in the picture below, many students believed the crane represented hope, love, or family. 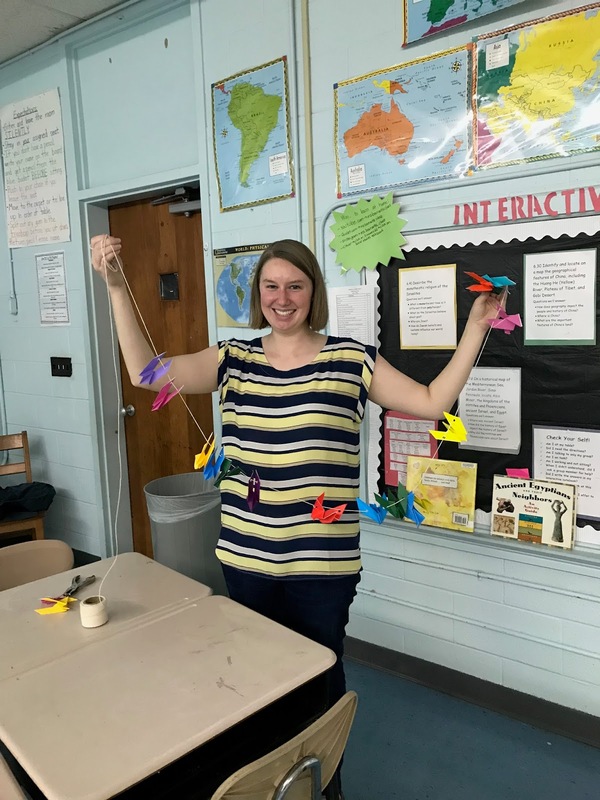 While this discussion was taking place, Cassie led the rest of the class in creating origami cranes of their own, there sure are a lot of crafty students in our Wright Middle School RAPS group! Next week, we will continue with our origami activity, and discuss the remaining chapters of Shaun Tan’s The Arrival! We had another great week at Cameron Middle School! Though we didn't have our seventh graders today, we were still able to have some fun with fifth and sixth graders. Since Valentine's Day is coming up, we wanted to share some aspects of our culture, and discuss some of the history of the holiday, and the reasons that we give gifts to one another and treat our romantic partner extra nicely on this day. After a quick discussion, we spent some time working through idioms around love and the heart. 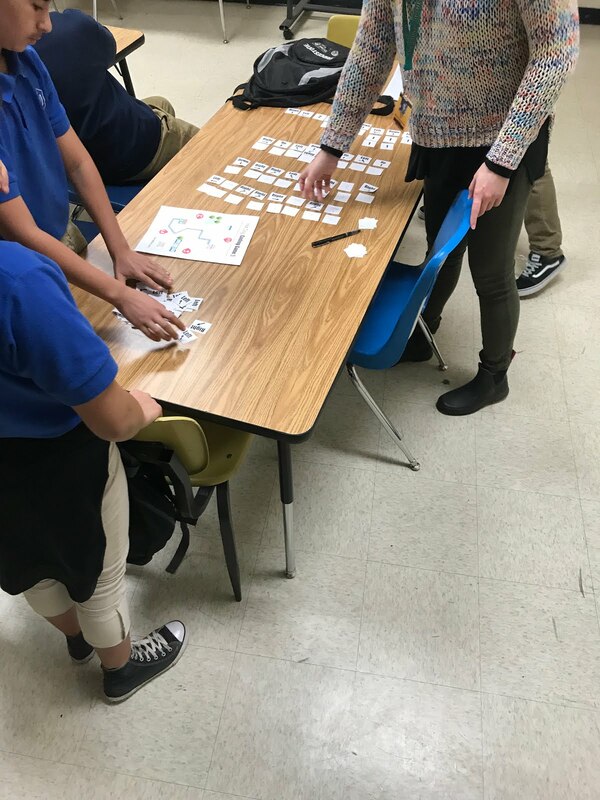 All of our students are learning English as their second or third language, so idioms and expressions can be particularly difficult for students looking to participate in American culture. We thought, since so many romantic idioms are funny, that our students would remember some of them going into the holiday, and we were fortunate enough to find representative pictures! Finally, we got the chance to help out with the English class between our RAPS' classes. Today, we helped students create their own comics, based on the graphic novel, Hidden. The story, focusing on a young, Jewish girl living in Germany during Hitler's rise to power. It was impressive to see students grapple with such mature content, while maintaining respect and expressing their own creative side. Next week, we may do some work around inventors and entrepreneurs, as that is the unit for our group in their normal classes. We may do some reading, or even some introductory coding! Welcome back McMurray Middle School! This is the first RAPS club time that we have been able to have this semester because of scheduling and Nashville’s snowmaggedon. It was really exciting to be back! We started with a book preview rotation. We had six different graphic novels that students perused after we discussed how to make book selections. 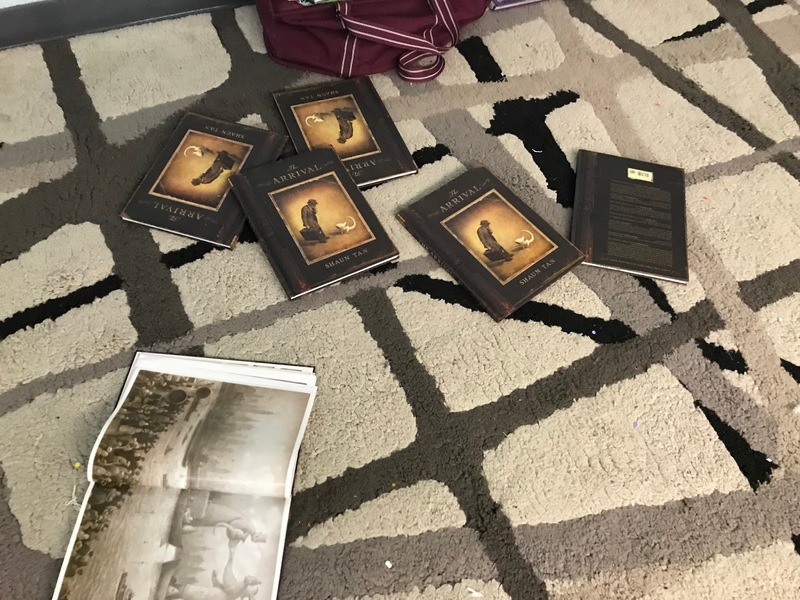 Students suggested that readers can look at the pictures on the front, the back of the book, and read the first few pages to figure out if they want to read it. At the end of club time, they got to take home the graphic novel of their choice, even though some proclaimed that they wanted them all and didn’t want to choose. 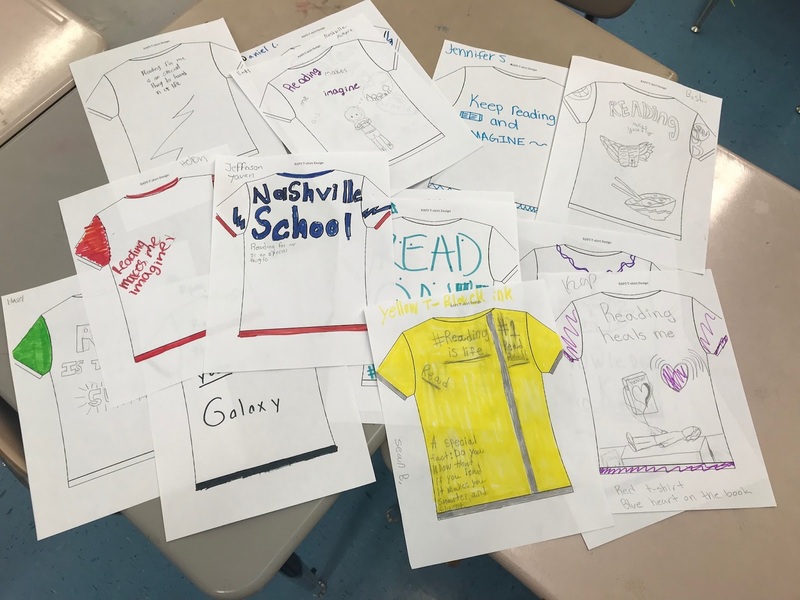 We concluded our RAP session by taking time to create student designs for a RAPS t-shirt. Students got pretty creative about what they like about reading, and maybe will inspire this year’s shirts. 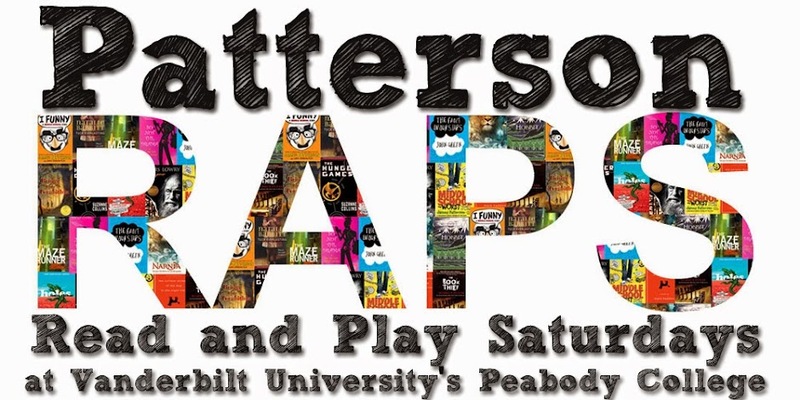 After several, several snow days at the beginning of the semester, Litton RAPS is back in full swing and we have so many wonderful things planned this month. We have begun literature circle/book clubs with the Litton group. Last week, students chose which book they'd like to read, formed groups, and chose their roles for their first meeting. The four book clubs are reading The Crossover by Kwame Alexander, A Long Walk to Water by Linda Sue Park, The Hunger Games by Suzanne Collins, and Refugee by Alan Gratz. Students engage in the books by taking on different roles each week (discussion director, quote master, context enricher, and artist). As the semester continues and we rotate books, we will add more roles. This is a really creative group! Today, students received their books that they ordered last month, and we placed a new round of book orders! It's hard to compete with the feeling of getting a new book to take home with you. We are so excited for next week's book discussions and to see the creativity that comes from this group.